“The Weekly Wine” feature has been gone a while mostly because I didn’t want to turn it into “The Weekly Whine”. Politics has played a part, a general lack of congeniality in some wine circles as well as the world, but also there hasn’t been a lot of really nice consumer priced wines being released. Oh did I mention it was summer? In any case I am resurrecting it for the fall and beyond as I’ve given up on politics, I can’t do much about congeniality and the fall release of wine looks promising. 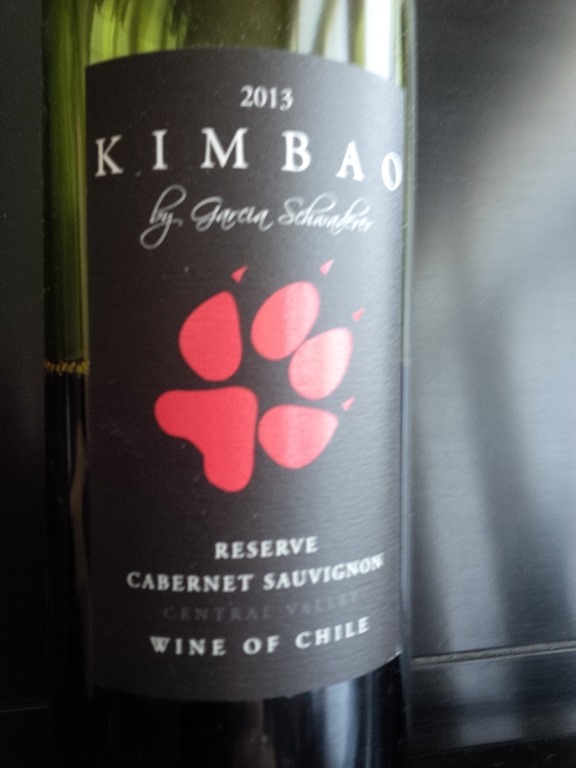 This weeks Weekly Wine, Kimbao 2014 Reserve Cabernet Sauvignon comes to us from Consta nza Schwaderer and Felipe who represent the best of the new rising stars in the Chilean wine industry I picked this out of an outstanding class of Cabernet Sauvignons I tasted this week partly because I thought was the pick of the litter but also because it’s a great example of a Modern Cabernet. To me this means it has a more fruit forward nose and taste than some of the classic Cabernets. It’s really drinkable and has really nice bones for some good aging. I tasted it over a three day period. the it I paired a very spicy meal, the second with a Pesto Chicken and on day three I paired it with crisp Bartlett Pears and Stilton and just drank it. I have included a detailed review of this wine in the wine reviews section of this site, if you are interested in some of its characteristics. If you find any of this wine (limited offering) and like it, or don’t, please let me know by leaving a comment to this post. This entry was posted in Chilean Wine, Wine, Wine Tasting and tagged Cabernet Sauvignon, Chilean Wine, Wine, Wine Making, Wine Tasting. Bookmark the permalink. Robert, by any chance are you a supporting member of Naked Wines? This is one of the winemakers that the funds of us Angel investors support. I am indeed am Angel (Archangel) on the US side. That’s a good catch, many of my weekly wines are from NW.